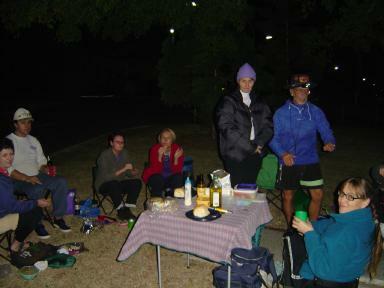 Winter had arrived early in Brisbane and about 12-15 hardy individuals braved a chilly evening on the river for a picnic / barbeque at Orleigh Park West End. 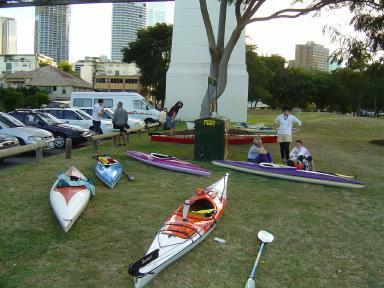 A core of regulars was joined by folks from Brisbane Bush Walkers and Murray and Judith from Karalee Kayak Club. Mark and Sue paddled up from Norman Ck and quickly set the pace when joined by the rest at the Story Bridge. Maureen and Judith were not comfortable in the folding double (Folbot Greenland II) so a crew change was performed at the ferry terminal near the Jazz Club. Murray provided sufficient ballast for Judith to be comfortable in the double and Maureen took up the forward seat in the Canadian. We rode the current upstream for an uneventful trip to Orleigh Park where Mark and Sue claimed a spot on the turning island at the car park under the lights near the landing pontoon where we could keep a keen eye on the kayaks. Folding tables and gas barbeques were quickly pressed into action. Practical options for opening the wine bottles proved elusive until Chris located his corkscrew. Judith and Maureen had other obligations so the Canadian was dispatched home with them, Murray and Tom took the double back to the Story Bridge. There was not a lot of river traffic on the way back, other than the Kookaburra Queen and The Island. Apparently it was too cold for the regular boaties and there were no invitations to join in their parties this trip. While it was an enjoyable evening, the early wintry conditions took the edge of a little. This paddle is probably more appropriate for a Summer evening.